Background : Son of Ernest George and Ina Mildred Wheeler; husband of Ethel Dorothy Wheeler, of Kingsford, New South Wales, Australia. Service & personal summary At enlistment : married (with 1 child of 17 months), brown eyes, light brown hair, medium complexion. Marks / scars : appendix scar, scar front right wrist. 10/03/1942 Marched into General Details Depot Sydney, New South Wales. 07/04/1942 Marched out to 14 Infantry Training Battalion. 08/04/1942 Taken on strength 14 Infantry Training Battalion Dubbo, New South Wales. 09/04/1942 Transferred to 9 Pioneer Battalion. 10/04/1942 Taken on strength 9 Pioneer Battalion. 25/07/1942 Detached to Pioneer Detachment Cowra, New South Wales. 03/08/1942 Transferred to 2/2 Pioneer Battalion. 04/08/1942 Taken on strength from 9 Pioneer Battalion to 2/2 Pioneer Battalion. 30/09/1943 Admitted 2/4 Field Ambulance Main Dressing Station with myositis right shoulder. 10/10/1943 Evacuated from 2/4 Field Ambulance Main Dressing Station to 2/11 Australian General Hospital and transferred to X list. 25/10/1943 Diagnosed fractured left clavicle. 26/10/1943 Evacuated from 2/11 Australian General Hospital to 2/9 Australian General Hospital. 09/11/1943 Diagnosed functional paresis right shoulder. 11/11/1943 Discharged 2/9 Australian General Hospital to New Guinea General Details Depot. 14/11/1943 Marched out to unit & struck off X list. 29/01/1944 Evacuated to 2/1 Australian General Hospital with gunshot wound left arm and transferred to X list. 09/02/1944 Discharged 2/1 Australian General Hospital to New Guinea General Details Depot. 21/02/1944 Embarked Port Moresby, New Guinea on S.S. Montoro. 29/02/1944 Disembarked Sydney, New South Wales. 29/02/1944 Taken on strength by 2/2 Pioneer Battalion from disembarkation to proceed on leave. 22/07/1944 Marched out to L.H.Q. School of Mech. Operation of Mechanical Equipment and Road Making Machinery course and transferred to X list. 27/09/1944 Qualified L.H.Q. School of Mech. Operation of Mechanical Equipment and Road Making Machinery course. 22/10/1944 Marched in from L.H.Q. School of Mech. Operation Machinery course - Liverpool. 03/12/1944 Marched out from 2/2 Pioneer Battalion to 1 Australian Corps Water Proofing School. 17/12/1944 Marched into 2/2 Pioneer Battalion from 1 Australian Corps Water Proofing School. 01/05/1945 Graded G.P.I. operator excavator. 13/06/1945 Promoted to acting Corporal. 20/08/1945 Rank of Corporal confirmed. 21/06/1945 Embarked Morotai for service in Balikpapan. 08/10/1945 Date of embarkation to Morotai amended from 16/03/1945 to 14/03/1945. 08/10/1945 Transferred from 2/2 Pioneer Battalion to 2 Mechanised Equipment Platoon. 11/10/1945 Transferred to 11 Works Park Company. 09/11/1945 Admitted 2/2 Casualty Clearing Station with Pyrexia of Unknown Origin (P.U.O.) and transferred to X list. 14/11/1945 Died whilst patient 2/2 Casualty Clearing Station. 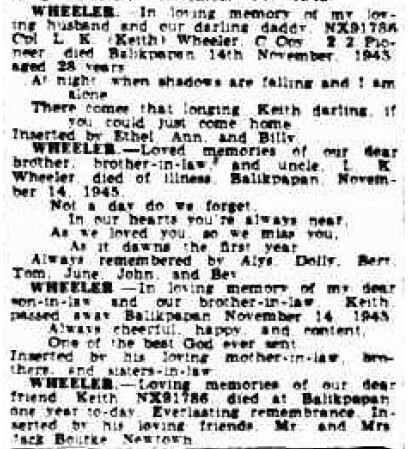 15/11/1945 Initially buried Grave 15, Row B Balikpapan, Borneo.